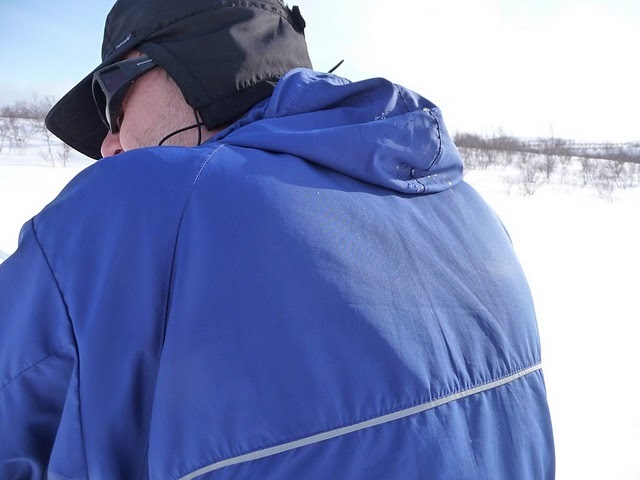 Here is the fourth and final installment about Joe Newton's and my skitrip up on the Finnmarksvidda, or Vidda, at the northernmost corner of Europe. Some snow and wind during the night changed into to a fairly sunny morning, with a biting, but not hard, wind and -10 C. Best weather so far by far. It was a nice change to be able to orientate as we skied along. The undulating landscape now lay open to our eyes with sculptured white land and blue skies make-believe summer clouds. The camera saw more frequent use this day than earlier on the trip, for some reason. After having skied for about three hours we could see a power line in the distance. It was of course the same one that we had passed under a couple of days ago, but then further south west. Looking at it and at the map, we made a slight change of plan. 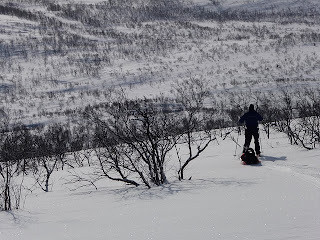 Since the powerline, like the river valley we had aimed at, also connected to the same network of roads that would led us out from the Vidda, we decided to use the powerline as our handrail instead. Powerlines are not ideal to follow, since they go in a straight line where men not always can follow, like over tops of mountains and across steep walled canyons. But on the other hand, if visibility decreased to near zero again, using the powerline as a handrail might outset its shortcomings. Lunchtime was taken in the sunshine on the flat, white expanse. I staked out my tent in the four corners, using it as a beach blanket. A very useful method if the crust is hard enough to at least sit on and you want to keep snow from creeping into every piece of gear as you make your meal. Also, if it begins to snow or blow it is very easy to just crawl into the tent and insert the tentpoles. Voila, you have a reliable shelter in seconds flat. There was no need for this though, we just leisurely loafed in the sun. I did my usual boots off-dry socks on-quilt on top-stunt, but by now my socks and boots was back to what can best be described as normal winter dampness. At least what can be considered normal if you do not have any boot covers, which for some years now has kept my boots with contents dry and comfortable. Now, skiing through snow that would melt on the boot uppers and keep the boot and socks damp all day, I was in the same situation as I had been years ago, before starting to use boot covers. And with comparatively lousier ski boots. The ones I had was just a pair of cheapo, oversized Alpinas, since boot covers sort of cover up the weaknesses of the boots. Ah, well, the experiences of handling wet and cold feet from those long gone army days and my own ski trips had probably served me well the last couple of days. In good visibility, crossing the upper end of the river we had aimed for that turned out to be no more than the dip in the terrain that we had hoped to find at the 'White Snake Crevasse' (actually the Vuoldávzi) that still gave us the shivers. As the afternoon progressed we traveled at a good pace across the white table, hit the powerline and began following it. Pretty soon we were coming down into the forest again. There among the birch trees a trail, probably for ATVs could be discerned and followed. At one place, crossing an open moor, the trail opening had been marked by the modern blazing of rigging a couple of beer cans on tops of branches. Descending and following the trail, that sort of parallelled the power line, the sky clouded over again and we set up camp in an overcast among the birches, with a view of lake Store Holmvattnet below in the distance. It being Saturday night I invited Joe over for a celebratory meal that I had with some trepidation suggested. I had brought a couple of cans of mackerel in tomato sauce, something I have often used on winter trips of old, to cheer myself up by eating something of both taste and substance as compared to the freeze dried goo. However, I was not certain that this Brit would fall head over heals for a doubtful delicatessen such as this. I need not have worried, Joe was well acclimatized to the Nordic High Cuisine, and we had a very nice meal with bread and soft tortillas to go with the bright red mackerel before turning in. It was our warmest night, with -6 C on the thermometer in my tent, when we awoke to a dull and overcast day with flurries of snow on the ever constant wind. 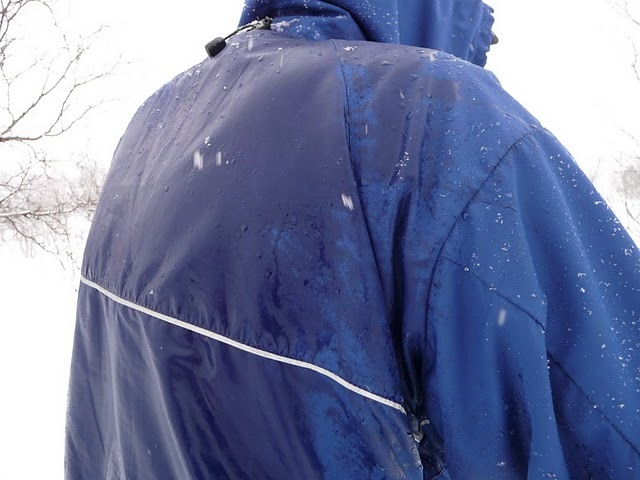 After breaking camp we took a photo of the soaked back of my Paramo Velez smock. While sleeping I always pull it over the foot end, to protect sleeping bag and quilt that are otherwise wetted down by pressing against the fabric of the tent wall. This works very well and the wet spots or ice on the smock do dry out quickly once I start moving. 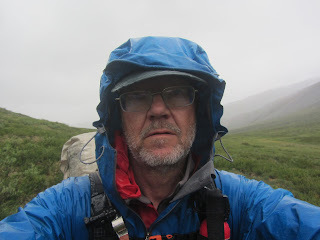 This morning, however, the Paramo was positively soaked, and I did not hang around for long before starting to ski, to avoid getting my back chilled. I need not have worried. After about an hour and half we took a new picture showing a completely dry back. By then the overcast sky and the snow flurries had given way to a blue sky and a beautiful, cool winters day. We had a marvelous downhill ski experience through soft snow, with trees sufficiently spaced to let us trail our rulks down, without skier and rulk ending up on opposite sides of trees. Going down I could only think: This is too good to last. Soon the snow will become softer, I will break through with my skis and end up on my nose. But, alas, we came down with no problems and big smiles on faces completely free of any snow. At the bottom of the hill we found a snowmobile trail and followed it to lake Langvattnet. By a small cluster of cabins on the north shore, two women, one older, probably the mother, were sitting in the sun just enjoying themselves. We stopped for a brief chat, that proved both interesting and useful. The younger of the women did most of the talking, obviously knew the mountains very well, and almost laughed at us when we mentioned that we had come up on the Vidda from the Mattis Valley. She agreed that it was a 'a bit steep' in those areas. The women could also tell us that we should be able to follow the powerline all the way into Övre (upper) Alta, where there were a number of camping sites/motels that also rented rooms and little cabins. They could not, however, guarantee that there was an open trail all the way, but thought it might have been run by skis and dogsleds. I assured them that we would manage anyway, and the younger one looked at me and said: Yes, if you came up the Mattis Valley I'm sure you will. Skiing away Joe and I concluded that a Brit and a Swede could probably never in a lifetime expect more of a recognition from a Norwegian. We had not gone far over the lake when Joe also got to enjoy the feeling of water around his ankles, sinking through the snow and into a sizeable overflow of water laying on top of the ice underneath. We rapidly backtracked and scraped Joe's skis clean enough from ice to let us go to the end of the lake and pitch our lunch camp. Now we knew that we had plenty of time in order to arrive in Upper Alta early Monday afternoon. This would give us plenty of time to shower, have celebratyr dinner in Alta and a good nights sleep before flying out on Tuesday at lunchtime. 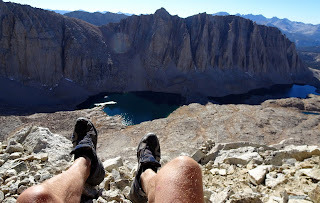 So Joe cleaned his boots and skis from ice, using his Gerber tool box, while I was sitting in my sleeping bag and quilt with all my puffy layers on, trying to get up to date with my trail journal. The sun was shining, but it was -7-8 C with a cold wind blowing from across the lake. After a couple of hours we were getting a bit chilled and it was high time to move on. We followed the snowmobile and skitrail, a couple of times being passed by people out skiing with dogs this beatiful Sunday afternoon. Temperatures sank as the sun kept its daily rendevous with the horizon, but with plenty of daylight still left we left the main trail and headed up towards the big lake Storvattnet. We choose a campsite high up away from the lake, to avoid the katabatic airflow on what promised to be a cold night. After setting up our tents we built a fire and could enjoy the warmth while cooking (and drying socks and feet...). It also gave us a chance to dry out some of our damp gear, like quilts and sleeping bags before retiring to our tents. We woke to a still -12 C morning in the pine forest. For the first and only time on this trip, we had breakfast outside. I just grabbed my entire bed and dragged it out the door of the tent; foam pad, NeoAir, WM Ultralite and homemade quilt. Then I got inside the sleeping bag again and fired up the canister stove beside me. After a leisurely breakfast we took a trip down to the lake. No katabatic air to be found anywere, the temperature on the lake ice was the same as in our camp up on the hillside. Ah, well, had we slept down by the lake it would probably have been -25 C. We then packed our gear and headed down the trail. The snowmobile track soon gave way to a lamp studded training trail for skiers as we neared the small community of Eiby. In bright sun we skied through the beautiful pine forest, along a trail that left us uninspired after nearly a week of making our own trails. After a couple of hours we came to a plowed road that took us down to Upper Alta and a motel room by the river. Great story, Jörgen. Had a smile as you wrote about the two ladies =) Also nice to see that the weather turned a bit nicer in the end. I reckon we will have to have a meet-up this summer/ early autumn to talk more about this adventure! A wonderful set of reports, Jorgen. Thanks! It was nice to finally see some sun in your photos, and get a sense of the plateau. From those images I can see the attraction of the place. Ach. Over all too soon. Bring on the gear discussion. 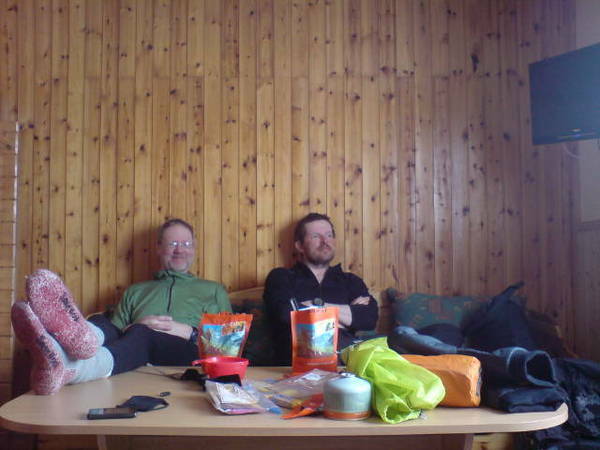 Fantastic to read and see the demands of backcountry ski trips in the far north. Thanks for sharing. You're welcome. Actually, this trip was one of the more demanding winter trips I have made. That is, for the first couple of days. 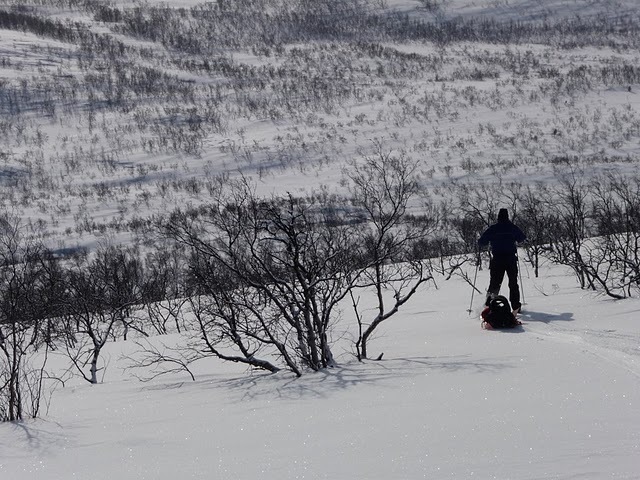 Last years skitrip in Sarek was literally a piece of cake in comparison, in spite of cold weather and the occasional hard winds. So backcountry ski trips are normally not this demanding. The thing is, they can be and you really do not know when it will happen. So experience and proper (not necessarily heavy) gear are of course important. But you can only become experienced by getting out there, and I hope that our experience does not stop anyone from getting out there. You just have to use common sense. These set of posts have been fascinating and thought provoking. Whilst I can never see myself taking on such an expedition, the thought of skiing on the sun drenched snow covered plains and then returning to a warm dry tent at night is very appealing. Whilst not in the same class the Bogong High Plains in Victoria Australia, can provide such an experience. I did wonder Jörgen whether you had a GPS as I wondered if that would have at least helped you in locating yourself (in whiteout conditions) and determining which map (or no map) were you on. Many thanks for a wonderful read which clearly caught the moods of the trip in my view. Yes, I had GPS in my HTC Smartphone, with a freeware geocaching software that allowed entering waypoints beforehand. I should have entered some more, though. Actually, not knowing EXACTLY where we were was not a big problem. Thanks to the GPS I could take cross bearing that were accurate enough. Also, using a GPS in conditions with poor visibility is in my mind the times when it is most useful. For instance, having a waypoint at your last campsite and a pretty or very good fix on the map of where that was will be very helpful. If you move on a known compass bearing in a whiteout the GPS will always give you the distance to your last known position/camp/waypoint. Knowing the distance and bearing to the waypoint does of course give you a fix on where you are.